Create Your Own Micro-Blogging Community at ShoutEm.comTwitter.com is the most popular and most used micro-blogging platform and community in the world, at least for now. ShoutEm has enabled the “public” to now create, build, and run their own Micro-Blogging platforms and custom communities based around any idea, network, or industry. Imagine the potential this could have in so many arena’s and the impact it could have on the world. Businesses, Schools, Teachers, Students, Musicians, Photographers, Scientists, Doctors etc. all having their own Micro-Blogging communities that are just like Twitter. Will Micro-Blogging take over WEB and be the new WEB 3.0? Take a look at all the features they offer, and unlike Twitter, you can customize the 140 Character limitation. You can also create and use your own custom domain names. Their Blog has more details about features and uses.Check out the “NFL” Nation, they don’t Tweet, They SHOUT! NFL SHOUTS~ Have a niche or vision for a community of your own? 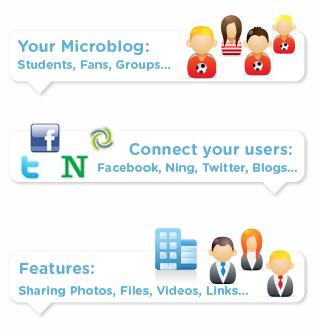 Head over to Shoutem.com and create your own Micro-Blogging Community, it’s FREE! Hey there,Cool post, I just found it and I’m already a fan.